O’Donnell and Schmitter assert that ‘democracy’s guiding principle’ is ‘citizenship’, which ‘involves both the right to be treated by fellow human beings as equal with respect to the making of collective choices and the obligation of those implementing such choices to be equally accountable and accessible to all members of the polity’.1 Specifically, democracy is characterised not only by the right of citizens to influence policy-makers, but also by the necessity of policymakers shouldering their responsibility to the public for their actions. To the extent that democracy can make the government more accountable to ordinary citizens, democratisation should entail an increase in governmental responsiveness to at least some public demands. 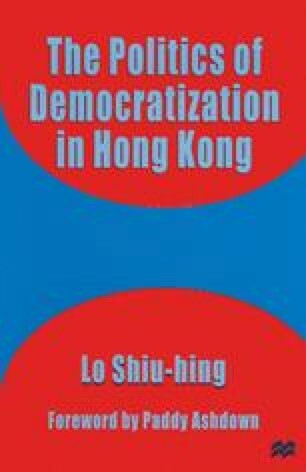 As Bingham Powell put it, ‘From the point of view of the democratic process, it is important that the government is doing what citizens desire and that it be responsive to their changes in preferences’.2 This chapter deals with the extent to which the executive branch of the Hong Kong government responds to popular pressure and demands, which have erupted since the unprecedented politicisation during the latter half of the 1980s.